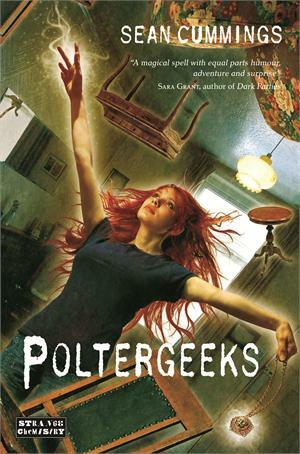 "15-year-old Julie Richardson is about to learn that being the daughter of a witch isn't all it's cracked up to be. When she and her best friend, Marcus, witness an elderly lady jettisoned out the front door of her home, it's pretty obvious to Julie there's a supernatural connection. The first thing that definitely drew me to this book was the cover. Its just the coolest imagery, to me it has a very comic book look, which blends well with the characters in the book both being into everything geektastic. It also tells you a whole lot about the story, which is always handy for picking a read suited to you!! From the get go, you really get that Julie the lead character is a hell of a sassy teen. The narration is totally contemporary, but then you have a supernatural twist on it. It really makes it for teens of today, so in that case I'm not sure of the long term reader appeal on this. I have to say quite often I felt really frustrated with Julie. Now this could partly be down to me getting older and not being as youthful but I just wanted Julie to listen to the advice her Mum would give her or actually speak to an elder. I couldn't read a reason for her to be so rebellious and so came my annoyance. I do also understand that the story wouldn't have gone very far if she hadn't of been a tad naughty, so in that end it was needed. For me this did feel like a very fictional world - of course it is fictional but when reading I love to be able to think about how things would work if this was real life. This just didn't have anything that I could see actually being real. For this it had a kind of Charmed / Sabrina the Teenage witch feel - both shows that I really enjoyed, so it didn't make the book a bad experience, just a different experience. Something that I really loved about the book was the setting of Calgary in Canada. I've never actually been there but my best friend moved there when we were teenagers, so it was fun reading of places that she had mentioned to me. I now want to go to Tim Hortons even more! There is definite room for expansion on the story. There are quite a few loose ends that would be great to see built on or sorted once and for all! A fun, sassy read for teens of today, that like a hint of magic!! Fab review, I love the cover and I can't wait to read this myself!